“…three of my favorite short stories included in this book were written by women I had never even heard of until I opened this book….My absolute favorite story was written by Robin Dance entitled, “The Generous, Very Kind Gift.” Author Robin Dance tells the story of almost missing a blessing because she was too busy to set aside what she was doing to see it. 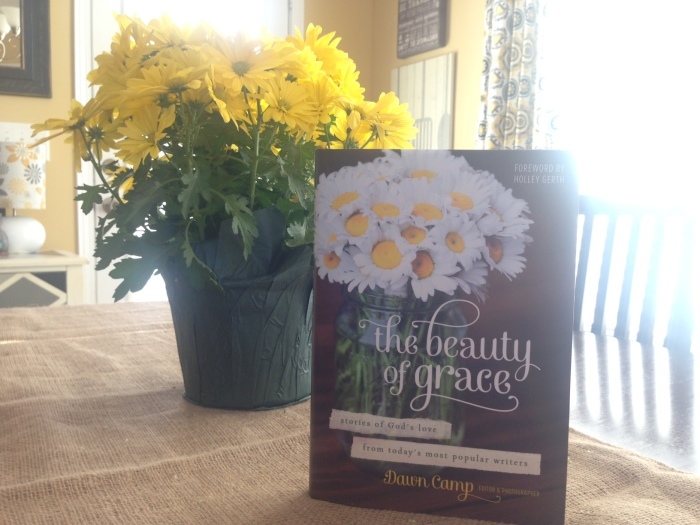 It was such a great reminder to always be aware of God’s blessings.” ~ excerpt from ChooseWisely in her Amazon review for The Beauty of Grace. Last night was a special one for my long-time blogging friend, Dawn Camp. 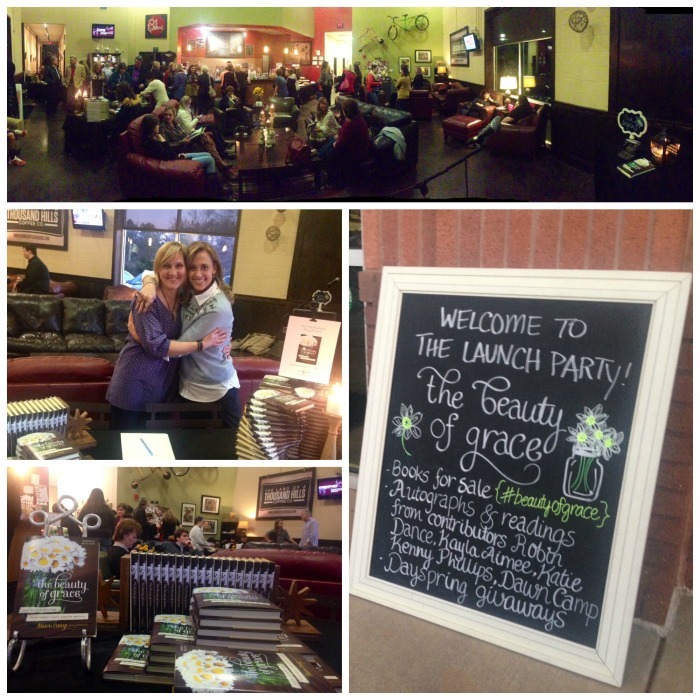 Amidst a crowd of supportive family and friends, she celebrated the launch of her first book, The Beauty of Grace. 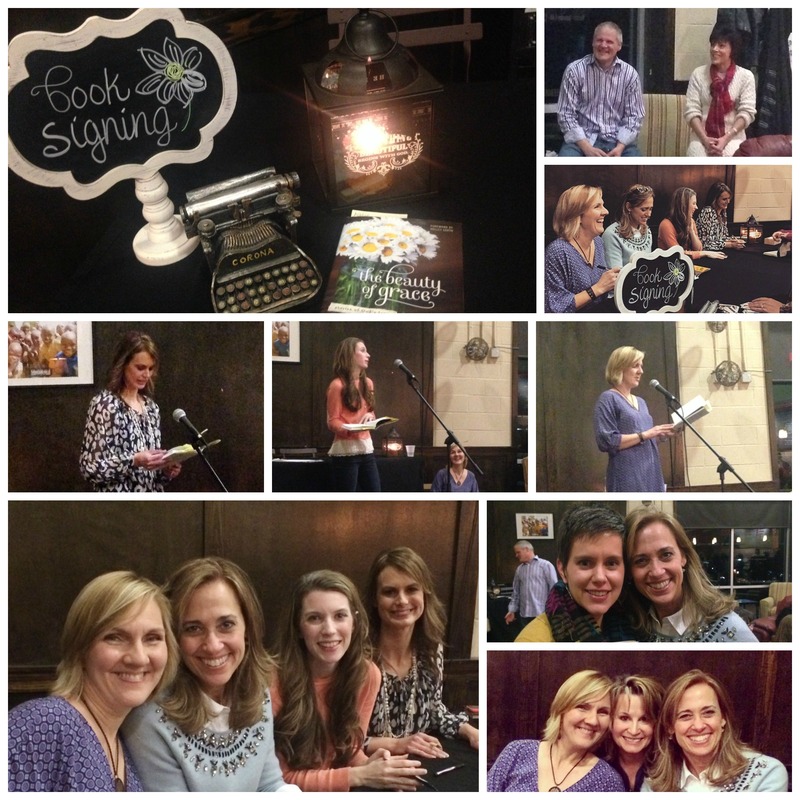 Ever kind and generous, Dawn invited three contributors to read our chapters – Kayla Aimee, Katie Kenny Phillips and me. Hearing Dawn and the girls read their own words made those stories come to life, and it was delight and honor to share the stage with them. And humbling…especially when I had a hard time reading my own work because apparently I write words I cannot pronounce. Seriously–you say incredulity and Dickensian out loud. It’s one thing to write a word and a whole nother to speak it. Mercy. Anyways, Dawn shared two things I wouldn’t have known had she not told me: my 75-year-old precious father-in-law left a comment on her blog (he’s never left one on mine! ), and an Amazon reviewer mentioned mine as her favorite contribution! I assumed it was someone very close to me (my sister 🙂 ), but it was from someone I don’t know, and, who had never before even heard of me (as will be the case for most people who buy the book)! Forgive me for sharing her words above, but they came as an incredible encouragement, the kind of soul-paycheck that spends better than gold. Panorama of Land of a Thousand Hills Coffee – The Warehouse (a great venue for an event like this! ), author (and friend) Dawn Camp and I before the chaos ensued, the darling welcome sign Dawn made to great guests, book sale table. Darling “book signing” sign; Dawn’s two biggest cheerleaders: her husband, Bryan, and her literary agent, Ruth Samsel; two of the precious book contributors who joined me in reading our contributions: Katie Kenny Philips and Kayla Aimee, and Dawn–during their readings; the four of us during a break in book signing (WHY am I the only one who doesn’t know where the camera is?? ), l-r, Dawn, me, Kayla Aimee and Katie; me and Amanda White, long-time blogging friend and author of Truth in the Tinsel, Dawn, Diane Bailey (another sweet blogging friend who made the trip) and I. If you haven’t yet added this book to your personal library, I sure hope you will. With Valentine’s Day coming up, it will make an affordable, sweet, inspiration-filled gift, too! Photo credit: I captured most of the images above, with thanks to Dawn, Diane, and Kayla’s friend Kaela for a few of them! Looks like it was a lot of fun! Wish I could have been there, but living in E. TN about 5 hrs. away from Atlanta-there’s no way! Congratulations on a good book Dawn! Thanks everyone for contributing to a great book!